Being a President does not mean you shouldn't catch some fun when you want. The President of the United States of America, Donald Trump was pictured at the Trump National Golf Club where he went to Play Golf. 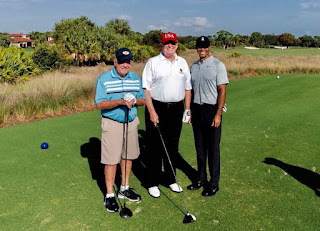 "Great morning at Trump National Golf Club in Jupiter, Florida with Jack Nicklaus and Tiger Woods!"